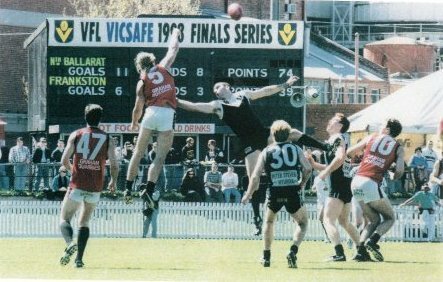 Thanks to Stanley ‘Digger’ Roberts, a North Ballarat and Big V stalwart, Scoreboard pressure has updated the Leederville page (with two photos from the May 2010 Western Australia versus Victoria game), and the Port Melbourne page (with a photo from the 1998 VFL reserves grand final). We’ve also added a few new quips to our Scoreboard quotes page, with Fox Sports talking about scoreboard damage in the Fremantle – Hawthorn game, Tim Lane talking about applying scoreboard pressure in the Carlton-Essendon game, the Hobsons Bay Leader talking about a player hitting the scoreboard, and the Age mentioning a scoreboard that plays Jimi Hendrix. Speaking of the media, thanks to Melbourne radio station RRR for the chance to speak about Scoreboard pressure on the Breakfasters program on 15 July, and to The Footy Almanac’s John Harms for giving us a mention on ABC Radio Melbourne on 27 July. And belated thanks to the Hobsons Bay Leader for its story, ‘The true numbers men’ on 31 May, and to the Age for giving us a few sentences on 22 April. Much appreciated.